The fabric doesn't stretch much. Micheline is wearing a size Small. Pictures by Laura Byrnes Photography, copyrighted images. New limited collection! 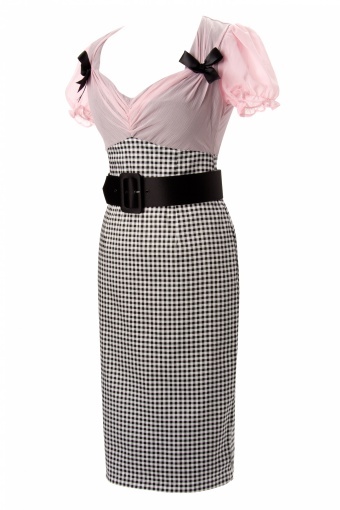 The L'Amour Dress in Gingham with Pink Chiffon Overlay from Micheline Pitt by Deadly Dames - Pinup Couture is named for Love for it embodies many features girls love. The bust of the dress is fully seamed, lined, and constructed to support one’s bust to the point where a bra is not always necessary. The cute pink chiffon overlay is gathered on top to give it a soft and feminine look. The sleeves are also chiffon with a soft twill elastic to allow for multiple arm sizes. The dress would not be complete without the black satin bows. 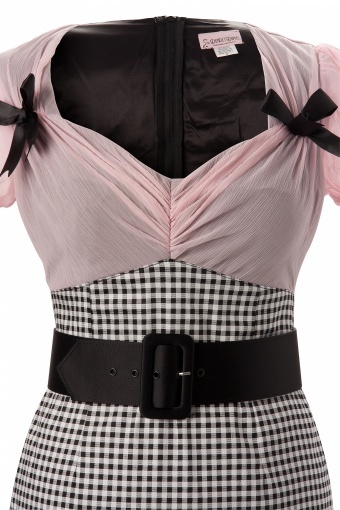 The L’Amour also comes with a removable black satin belt. The skirt is made of cotton sateen and is fully lined in a smooth stretch charmuse to give a flattering silhouette. 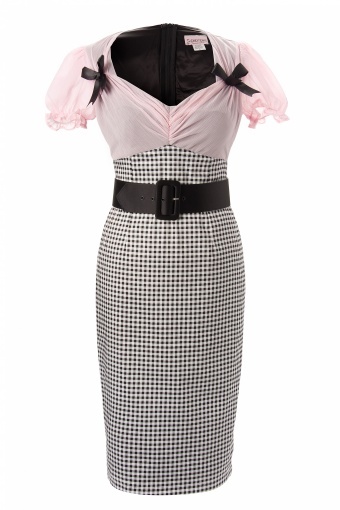 Like all Pinup Couture styles this high quality dress has a perfect fit and gives every woman some extra vavavoom! Available in 3 different styles! The Chiffon has very little stretch, so if you have broad shoulders or a larger bust (E+)please order up as it will not stretch past the size listed on the sizechart. Ik heb alle drie de l'amours van deadly dames. PRACHTIGSTE JURKJES OOIT. 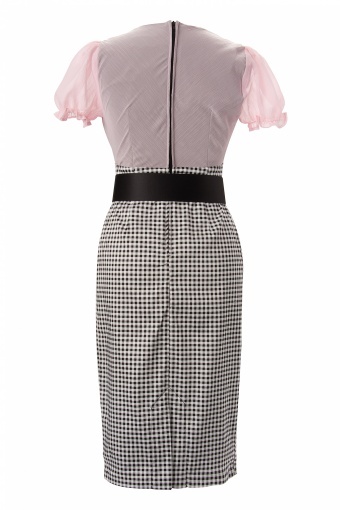 Ook het rokje van pin-up couture (pink roses pencil skirt) is helemaal fantastisch.